Usually the interference fit is calculated using thick ring theory assuming two cylindrical rings and plane stress. The interference between the parts is determined by manufacturing tolerances and some embedding due to surface roughness can be considered. DIN 7190 (2001) proposed a reduction of effective interference by 0.8*Rz, which was reduced to 0.4*Rz in DIN 7190 (2017). 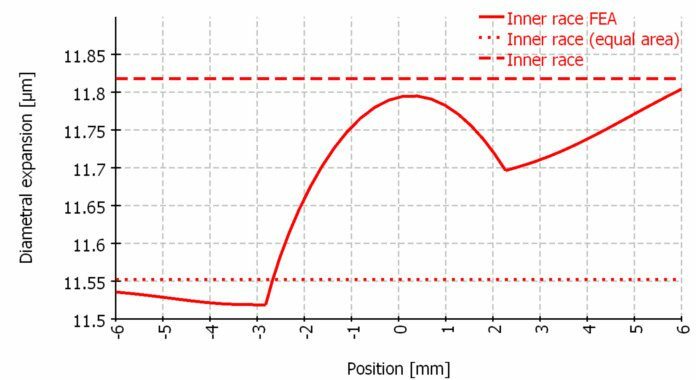 The sum of surface roughness of the two parts in contact should be considered, but as in most cases the bearing ring will have a much smoother surface than the shaft and the housing, it should be sufficient to consider the surface roughness of the shaft/housing only. 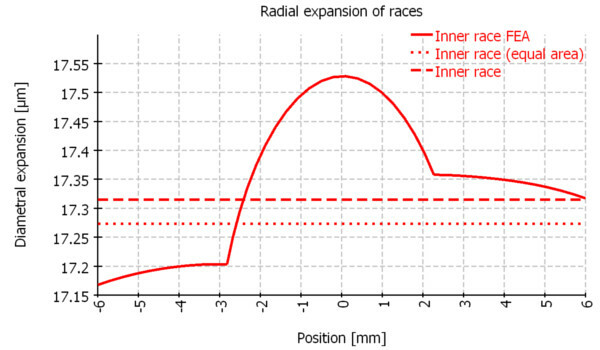 For the calculation of the interference fit the ratio of inner and outer diameter of each ring is required. For the outer diameter of the inner ring and the inner diameter of the outer ring, the question is, how to determine this diameter. 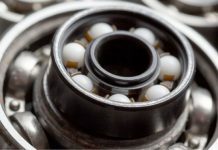 Some bearing catalogs mention the raceway diameters others an average diameter between raceway diameter and the shoulders. To get an estimate about the influence of the shoulders of the bearing rings on the change of effective clearance an axisymmetric FEA calculation was added to the MESYS bearing calculation software. The diametral expansion on the outer contour of the ring is shown in a diagram in comparison to the calculation of cylindrical rings according to thick ring theory. Two options are considered for thick ring theory. 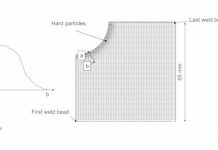 Either the pitch diameter plus/minus ball diameter Dpw±Dw is used for the second diameter of the ring or a diameter leading to the same cross section area as the real cross section including shoulders. 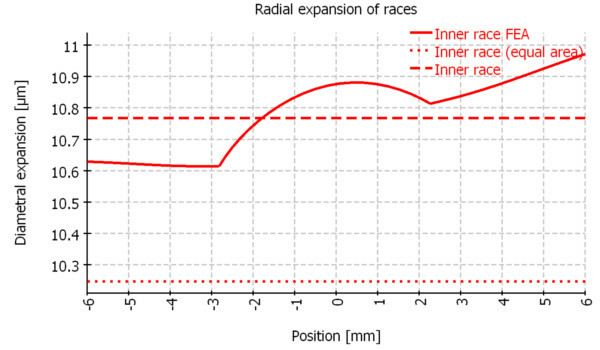 Figure 1 shows the diametral expansion of a 71910C bearing inner ring considering an interference of Iw = 13 mm and speed zero. The solid line shows the expansion of the outer contour of the ring according to the FEA calculation, the dotted line shows the expansion using thick ring theory and a diameter for the equivalent cross section and the dashed line shows the expansion for thick ring theory and the outside diameter Dpw-Dw. It can be seen that the expansion in the middle of the bearing is very close to the value not considering the shoulders and the value at the left shoulder is closer to the value for the equivalent cross section. It should be noted, that the difference is about 0.3 mm, so the effect of unreliable smoothing of the surface roughness is larger than this variation. 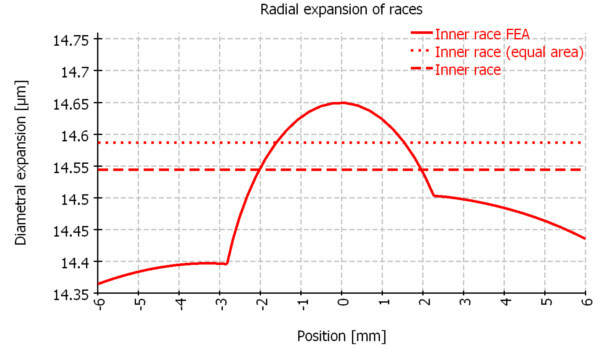 Figure 2 shows the result of the same example, but with rotation speed of 30000 rpm. Here the expansion of the equal cross section case is larger than in the case without considering the shoulders. The reason is the larger mass and the larger effective diameter for the centrifugal forces. 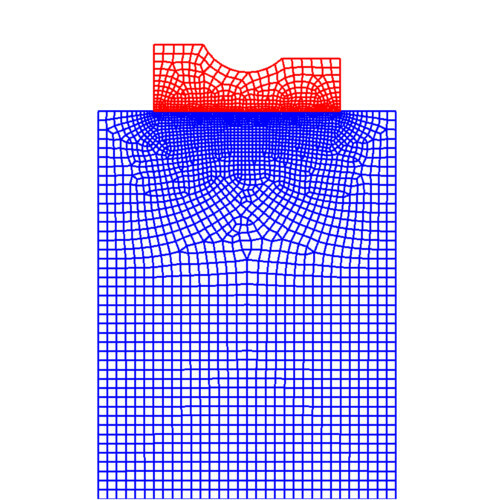 Figure 3 shows the mesh used in these two calculations. The width of the shaft is a little larger than the bearing width as it is in real applications. Quadratic elements are used. 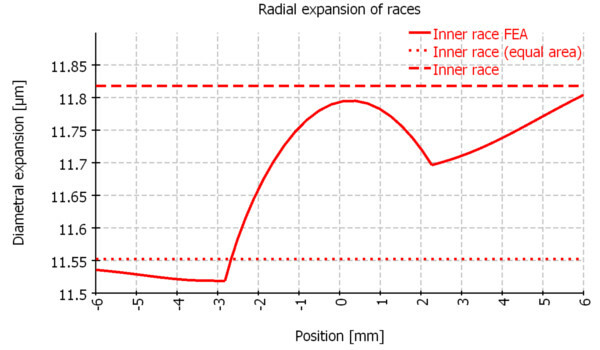 For the same example a hollow shaft with inner diameter dsi = 30mm instead of a solid shaft is considered in figures 4 and 5. Figure 4 shows a larger difference for the two cases based on thick ring theory. The case with equivalent cross section is too stiff here. Including centrifugal forces the differences are small again. These examples show that the consideration shoulders for the calculation of fits is not required in many cases and a calculation using a simplified approach with Dpw±Dw can lead to more accurate results for low speed cases. Still mostly the differences are much smaller than the effect of surface roughness would be. If a shaft width equal to the bearing width would be used, the expansion of the ring based on the FEA calculation would be smaller and closer to the results considering the equivalent cross section. But as in real applications the shaft and housing width is larger than the bearing width in almost all cases, this was assumed for the FEA calculation, too. This FEA based comparison was added in MESYS Rolling Bearing Calculation software 12/2017. For further information visit www.mesys.ag or contact info@mesys.ch.